In Fallout 4, you will find countless mods to improve the graphics and appearance or modify individually. The mod community is also very active and provides not only new content, but also practical enhancements and performance boosts for Fallout 4 for a new look. But the huge mod selection is very confusing plus unsorted. There are many mods that only individual objects embellish (or at least changed individually). We provide an overview of the Mod for Bethesda's wasteland epic and show our opinion on ten most beautiful graphics mods for Fallout 4. We have taken care to present the widest possible range of mod-categories and also provide recommendations for appropriate mod combinations that harmonize particularly well. About 200 years after the Great War, the world of Fallout 4 still looks devastated. Who does not like the Mod “Commonwealth Conifers Redux." It provides a green, living environment and forest areas. The mod creates a great post-apocalyptic atmosphere that reminds us a little bit of 'The Last of Us. " The Mod “Seasons Project” brings the right look for each season. Whether lush green in spring or a barren winter landscape, with a few clicks, the Commonwealth adapted to one of the four seasons. However, it can be activated only one season at the same time, who works with the Nexus Mod Manager or the Mod organizer, can change the seasons with a few clicks. A complete revision of the storm system offers "True Storms. It brings new, severe weather, revised sound effects, textures, fog, and more. The weather can also be adjusted in the game over the PIPBoy. The Mod "Vivid Landscapes" revised landscaping and ground textures, in the 2K variant it saves even a bit VRAM. Who is on maximum graphics should refer to the 4K textures, but require much more VRAM. Even with "Vivid Rocks" can improve a little performance. 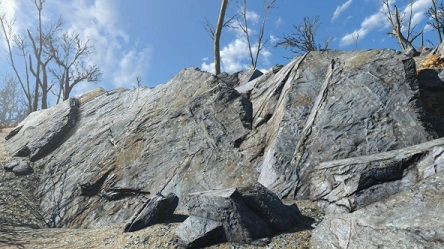 The Mod revised every rock textures and requires less VRAM than the original textures. The Commonwealth looks clearly sparse? The Mod "More Grass" would change that. It increases the density of grass, small stones, seaweed and small lumber, thus ensuring a tighter game world. Since the mod only increases the grass density, otherwise to change something without textures or, they can be easily combined with other Vegetations mods. With the Mod “Vivid Waters” the water of rivers, lakes and seas is optimized. New textures and optimized reflections provide a more realistic look. They can be ideal combine with the Mod “W.E.T. ", which additionally Rain Textures, spray and more optimized. "Vivid Weathers" revised the weather system completely. In addition to 75 new weather types, there are over 100 new clouds textures, sound effects and many other adjustments. In addition, the Snow is added, which can be ideally combined with the "Fallout 4 Seasons Project". With the Mod “HD Reworked Project Revised” numerous object textures are optimized. Here, the mod author has paid claims to it, not to unnecessarily give much performance. For example, small objects do have nicer textures, but these are not unnecessarily large. The mod package is also available for Witcher 3. The Mod "All Weapons HD" takes the majority of weapons in Fallout 4 and scaled their textures from 2K to 4K high, used the original textures as a starting point. Although it is not a complete review of all arms, the change is visible and pleasantly subtle. Darker Nights ensures an immersive gaming experience by making the nights of Fallout 4 significantly darker. In addition, you can define in the mod, if it allows you to be discovered but more difficult at the same time. For this, the Mod »Fr4nsson's Light Tweaks", the fake lights from the game fits away, even to characters around and the lighting thereby making realistic.